The western media would have been considered to be balanced and objective in their style of reporting if they have dealt with or exposed the unfortunate and age long incidence of theft, abridge of copyright and human rights law, invasion of piracy, massacre, etc, which the fore-fathers of African nations witnessed especially Nigeria. But they rather pride in writing about Nigeria and Africa within the context of corruption, violence, fraud, pestilence, insecurity, dishonesty, war, HIV/AIDS, diseases etc. Meanwhile the injustice done to Nigeria about 112 years back by the British imperialist was and is never in the news, at least to the best of my knowledge. History has it that sometime February 1897, the then British empire out of a coercive step which it termed “Punitive measure” invaded the old Benin Empire (ancient Benin Kingdom), now located in Nigeria, and deposed Oba Ovomramwen to Calabar in the present Cross River state of Nigeria, slainning many of his traditional chiefs and killing innocents in the city. The British imperialist then raided the private cultural centre of the Kingdom by stealing and exiling more than 3000 artefacts belonging to the Kingdom. 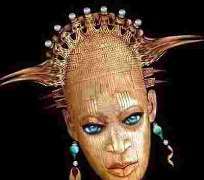 The most famous of these art works was the Queen Idia mask. One will recall that it was the replica of this mask (cast in bronze and ivory) that was used in the branding of the Festival of Arts and Culture in 1977; a laudable and veritable initiative of General Olusegun Obasanjo (FESTAC 77). Presently the mask is conspicuously and dubiously lying in the British Museum while innocent minds take a look at it, without minding its origin or the rightful owners. It will be so painful and most unfortunate if the predecessor(s) of that curator that made the mask or any of the descendants of Oba Ovomramwen happen to come to UK and would have to pay before visiting the artefacts in the British Museum. In 1997, the International Council on Museums, ICOM declared that the looting of archaeological items and the destruction of archaeological sites in Africa are part of the cause of irreparable damage to African history and hence to the history of humankind. ICOM also reiterated that the whole sections of African history have been wiped out and can never be reconstituted. It is extremely disheartening to know that the financial gains by the British Museum from the Benin artefacts alone is conservatively estimated at around 100 Million Pounds, (N25, 000, 000, 000 trillion Naira), and no remittance has been made to the Benin or Nigerian government's coffers. Also in 1874, Britain in a manner similar to the Benin holocaust carried out what they also termed “Punitive expedition” in Kumasi, Ghana, against the Asantehene (King) who had earlier resisted every attempt made by the British to reduce his economic as well as economic control in the former Gold Coast region for the selfish interest of the European country. It is a known fact that the British were attracted by gold which existed in the region. This resulted in the attack of the region led by the British Punitive Army under the leadership of Sir Garnet Wolseley. The King escaped which gave the British the opportunity to enter his capital stealing every valuable objects available including different artefacts worked in gold and silver, and the 20-centimeter high golden head believed to be the largest gold work ever made by man in Africa. This work fraudulently found its way in Wallace Collection in London where it now dubiously sits. A lot of Nigerians (Emmanuel-Ajibulu inclusive) have been agitating for the return of this artefact and several other artefacts that was stolen away by the British under the guise of colonialism. I understand that Professor of Political science and Director of Centre for Black and African Arts and Civilisation (CBAAC) Tunde Babawale, had written a letter for the return of the artefact but I refused to believe whether he ever got any feedback or an acknowledgement for the receipt of same. Also, Mr. Obinali Egele, the Director of Markets and Investments, producers of Crown Fraud, made several attempts in advocating for the return of the mask, through different TV appearances and many writings in the print media but all to no avail. The stealing of our artefacts by Britain and other European countries is nothing but cultural stealing. This was an attempt to steal together our cultures and ship them to Britain and other ''dens'' located in Europe and America. Concerned African countries should never relent unless these works are totally recovered. The case of Britain and the stealing of Queen Idia mask are seemingly shameful and discrediting to the British most respected and shining image. Sometime 2006 UK intellectual property office accepted the application to register the mask as a trade mark. Details were published in the UK Trade Marks journal with the caption—African Resource, Looting African Arts, Thursday, 10 April 2008, for 3 consecutive months to allow for any objections. The British Museum had every opportunity to oppose the application if they had rightful copyright. They did not oppose it. As a result, the trademark certificate was registered in the UK by Markets and Investments in June 2007. When we talk of rule of law I don't think the British government have respect for it, because if it does, by now the mask should have been back here in Nigeria since. It is hard to believe that Britain has remained defiant to Article 11 of the UNESCO 1970 Convention on cultural objects taken across borders clearly defines "as illicit, the export and transfer of ownership of cultural properties under compulsion arising directly or indirectly from the occupation of a country by a foreign power. This is an open appeal to the British government to do the needful for the sake of justice, respect for the rule of law, and for the protection of its image as a world leader who often canvass for cultural unity among nations. I have no doubt in me that with the British long standing records of human rights protection, justice would be done soonest. Also, other institutions expected to precede actions over this issue are my colleagues and senior colleagues in the media, Nigeria ministry of Foreign Affairs, Ministry of Culture, Attorney-General of the Federation and the Nigeria High Commissioner to Britain. God bless Nigeria and Africa at large. Emmanuel Ajibulu is a Nigerian based in Lagos and representative of Modernghana.com in (West Africa) Nigeria.